Solid wood pine construction offers strength and style to this entertainment center with a large TV stand with a fireplace insert. 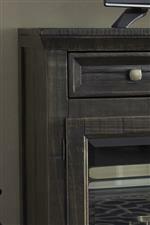 Rough sawn distressing and a waxy grayish brown finish offer rustic styling, while contemporary hardware knobs add a crisp and sophisticated finishing touch. Adding functionality to the TV stand is a fireplace insert and integrated audio Bluetooth speaker. The fireplace insert has LED technology and a remote control with LED display. Its realistic wood burning flame effect combined with life-like logs creates an inviting atmosphere. It features two level temperature setting and a 20 watt high quality fan. The insert features a thermostat heating and overheating control device and a down light. Its flame operates with or without heat. The Townser Entertainment Center w/ Fireplace Insert by Signature Design by Ashley at AHFA in the area. Product availability may vary. Contact us for the most current availability on this product. W636-30+W100-01 Large TV Stand w/ Fireplace Insert 1 62" 20" 35.75"